I was reading a book in my living room. Enjoying the quiet before all the kids were home from school. Something blurry passed in my peripheral vision. I looked up to get a better view. 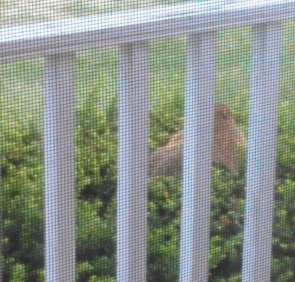 I jumped back when I saw that a groundhog was walking on my porch. I was freaked out. My daughter came home from school at about the same time. She ran in to the living room to see why I was screaming. She saw the groundhog walking on the porch, too. She wasn’t freaking out. I looked at her. She looked at me. I explained that I was caught off guard by this creature walking around as though he owned the place. This is the same creature who digs large holes in our yard. The same creature who we have tried…unsuccessfully…to get rid of. He was mocking us. Taunting us. Letting us know that he wasn’t about to leave any time soon. A few moments later, I composed myself. Got back to my book. I settled down to read. Then another blur caught my eye. This time it was a green and brown blur. What n earth was it? It was our friendly, unwelcome neighbor…the groundhog, that’s who. This time he was in one of the front bushes. He was squirming to stay upright and presumably not get poked by the prickly, thorny branches. This time I was not screaming. In fact, I laughed so hard to see this fellow pop up and down in that bush. He was trapped for a bit, then would un-trap himself. He’d squirm a little more. Go down deeper in to the bush. Then come up for air. I explained to my daughter that a groundhog walking free was terrifying to me, but a “Groundhog-in-a-Bush” was absolutely hilarious. She walked away shaking her head. What can I say? I have a warped sense of humor!